Link to the Alika Herring Mirror Log! by Jack Herring his son. Previous Articles . . . . Welcome to Cave-Astrola.com! 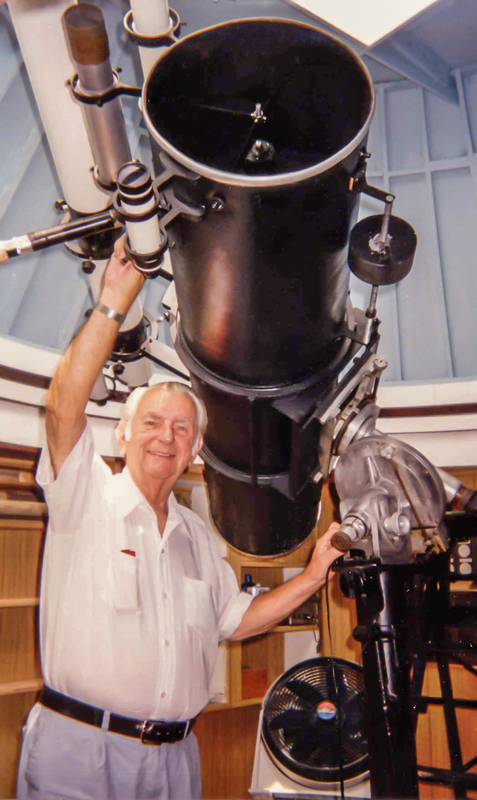 This has become a very special project that I felt I needed to do to preserve the history and life of a very special amateur astronomer, manufacturer and telescope pioneer, Thomas Cave. Please wander through the pages of this site and try to get a feel for a time gone by. The period is early 1950's to 1980. Cave introduced a telescope for the amateur astronomy market that had quality optics , a solid heavy mount and motorized tracking. The Cave-Astrola telescope became the most sought after equipment for the back-yard astronomer. Southern California was the hotbed for amateur astronomers and the birthplace of many telescope and telescope related companies. The planet Mars and it's canals became the craze. Thomas Cave and his father began a company to fulfill the needs of a growing astronomical and telescope community. This is a collaboration of information from contributors from all around the world. I have collected articles and images from authors, newspaper reporters, Cave family members, friends, astronomers, co-workers and fellow historians. If you would like to help preserve this interesting period in our history of telescopes, please feel free to contact me using the contact page. Materials have to be original and owned by the contributor. Full credit will be given within these pages. Contributions do not have to be formal and in magazine quality, but can be as simple as remembering a conversation with Cave on his back porch. Many articles are still to come. Changes will be posted on the sidebar to the left. The blog will also include the list of new articles, pictures etc as they are added. Enjoy! If you've been into astronomy for more than twenty years, you've probably heard of Cave Optics, which at one time was a pre-eminent maker of mirrors and Newtonian telescopes for the amateur and government market. They had a solid reputation for the quality of their optics, and to this day a Cave mirror is eagerly sought after. The driving force was Thomas R. Cave, an inveterate Mars observer who went on to found the company that bore his name. In 1958 I built my first homemade reflector using a 6-inch, f/10 Cave mirror that was a superb performer. Although he lived most of his life in the Los Angeles area, Tom Cave's interest in astronomy began in 1930 when he was eight years old and visited Chicago's Adler Planetarium. Shortly thereafter, he became particularly enthralled with the planet Mars. As was the case with Clyde Tombaugh, Cave's observations as an amateur brought him to the attention of Lowell Observatory. He had sent reports of his observations of Mars with a 6-inch Newtonian to E. C. Slipher of Lowell. In 1941, Slipher offered him a position as observing assistant, but Cave was then working as an apprentice at an optical company and turned down the offer. He went on to become one of the most skilled opticians, and with help from his father, he founded his own company in December 1950. Cave favored large instruments, and to some extent is responsible for making amateur astronomers realize that they could move beyond the usual 6-inch reflector that was common at the time. In 1949, Cave had produced a telescope for his own use - a 121/2-inch, f/11.3 giant. A friend of Cave's, O. R. Norton, was invited over to see it and is quoted in the August 1994 issue of S&T: "I arrived at 265 Roswell Av and passed through the gate to the backyard - and into another world. Before me stood a leviathan of a telescope, so large that it would have taken a 12-foot ladder to reach the eyepiece." Large Newtonian telescopes up until roughly the late 1970's were heavy and ungainly pieces that often required a permanent installation of some sort. But the advertising tried to downplay their size. For example, an ad for the Cave "transportable" 121/2-inch shows a young woman standing next to it. The eyepiece was quite a bit over her head, but most people would assume that women tend to be shorter anyway. However, the female model chosen for those ads was 6-feet tall! By the time Thomas Cave sold the business in 1979, Cave Optical had produced about 83,000 mirrors and 16,000 complete telescopes with mountings sold under the Astrola brand name. In the company's later years, they also made a few refractors. Cave had decided to sell the business due to ill health, but the advent of the newer Schmidt-Cassegrain design by Celestron created serious competition for his company, which had concentrated almost entirely on making telescopes of the Newtonian configuration on hefty German equatorial mounts. Cave Optical was soon liquidated by the new owners. Tom Cave himself continued to work part time in the optics business for other companies but retired for good in 1988. He passed away on June 4, 2003. The Hardin Optical Company purchased the rights to the Astrola name and now sells telescope products under that brand. It's appropriate though - Larry Hardin got his feet wet in optics working for Tom Cave!